(Washington, D.C.—Nov. 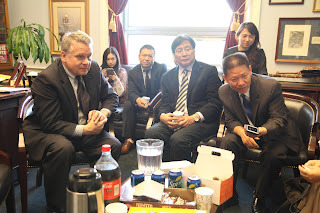 26, 2018) The Congressional-Executive Commission on China (CECC) announced a hearing scheduled for Wednesday afternoon, spotlighting the Chinese government’s mistreatment of religious individuals. According to the announcement, the hearing will take place from 3:00 p.m.-5:00 p.m. at Dirksen 106 and be livestreamed via the CECC’s YouTube channel. At the hearing, three witnesses will present their testimonies: former Uyghur prisoner Mihrigul Tursun, the Religious Freedom Institute’s Dr. Tom Farr, and Dr. Samantha Hoffman from the Mercator Institute for China Studies and the Australian Strategic Policy Institute. The event will focus on China’s abuse of multiple religious faiths, including Uyghur Muslims, Falun Gong practitioners, Christians, and Tibetan Buddhists. ChinaAid supports hearing such as these as part of our initiative to expose China’s abuses and promote religious freedom, human rights, and rule of law.